Because I've been writing on my book! I'm very close to 25K, but I had to rewrite an entire scene to fix it; it didn't work the first time. Or, well, it worked exactly as I wanted it, but I realized it was implausible given modern protocol. And I always am just like, ehh, how many people are really going to care, but I angst more over how implausible the ordinary stuff in my stories is than the extraordinary stuff. I also took a break tonight to go to some Comic-Con related events and just generally chill along with dianamcqueen. We drew pictures together! katieupsidedown, we went to a bar called Side Bar, and it made me think of you. I was wondering, do any of the people on my friendslist have a habit of buying clothing or shoes that you are not brave enough to wear? I have a tendency to buy things that are very beautiful and well-made and fashion forward because they are exciting in the store, but then I get them home and I just can't bring myself to wear them in public. 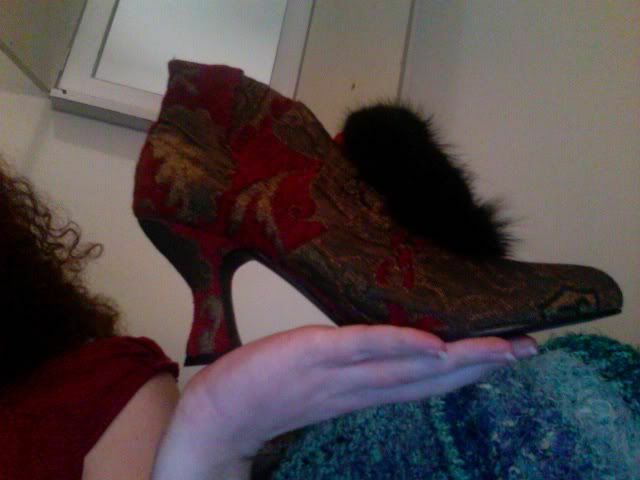 I have a lot of shoes like this, beautiful shoes that I feel like I need an excuse to wear. Tomorrow I get to spend the afternoon at Comic-Con! And I will probably go for a bit this weekend, but it's not nearly as stressful as last year. Is anyone else here going to be there? Let me know! Generally, things are good. Hello, lovely friends. I love you all! Oh, that is me with skirts. I go through periods where I want to feel girly so I set on a quest to find skirts. And when I finally find something that looks nice, I can't help buying it. And then it hangs in my closet forever. There's always an excuse not to wear it. I think I've given away at least 3 jeans skirts. Currently I have a nice knee-length white & blue skirt from Benetton and a nice long beach-y skirt in my closet. I think I wore the latter one once. I wholly encourage you to wear incredibly lovely shoes with straight-legged jeans and a plain t-shirt. If at any point you feel ridiculous, just sit down, hold your feet out in front of you, and admire them until you get a second wind. Really, it's a liberating experience. I would love to do that, but I can't wear jeans to work! Part of the issue for me, especially with shoes, is that I always feel so awkward wearing heels, or I choose the shoes that will be more comfortable for walking ten blocks. I could bring them in a bag to work, but it always seems like an extra thing! I do this with clothes too. Mostly things that are oddly cut, but somehow appealing to me. I have a skirt that I absolutely love, and it has a sloping hemline... I'm afraid it's too odd to wear out though. I don't like getting attention for what I'm wearing. I don't mind attention, but I am always worried that it's going to look shlubby on me! WOO. I just had a beer and some sliders but they were good sliders! If I do, I will! I'm not really all that fashion forward, so nope. Sometimes I get something and then don't wear it much because it shrinks or I put on weight, and then I feel uncomfortable in it. You are beautiful most of the time! I sometimes buy dresses. And then they sit in my closet because I never wear dresses. I have mostly stopped now, if only because I already have half a closet full. You should wear some of them! This is part of my problem but I can wear dresses at the new job! OMG, yes. I bought a bright green, beautifully cut coat this year, which I do wear (because it is my only coat) but I always feel SO self-conscious. I hope it is training me to care less about whether or not people are looking at me. I actually have no problem with people looking at me-- I wear a lot of ridiculous hand-made hats. It's more that there are certain things that I feel out-of-place wearing, like I am too ordinary/old/young/tall/short/boobified/fat/skinny to be allowed to wear them. WHOOOOOOOOOO GO MAGICAL BOOK WRITING POWERS!!! I totally do the clothes/shoes thing, though I try really hard not to. I have a GORGEOUS pair of cork heels with awesome stitch work and gemstones on the heel, they look like earth mother goddess shoes and they actually look good on my feet. But I never wear heels, and when I wear these, I feel like I'm towering over everybody on the entire planet. So I just saw this post, but I sent you back some feedback a little while ago. I'm afraid I was too late to be useful though. :( I'm sorry! It shouldn't take me so long when my life isn't all going to hell. Not so much with the outerwear, but definitely with the lingerie. I have a few corsets that I've never worn. That is one of my problems. Colors I have an easy time with-- I wear TONS of crazy colors. It's more styles. I remember the Side Bar. glad things are going well and you're writing. yay you! ps I finished your scarf. I can't decide if you need fringe. please advise.